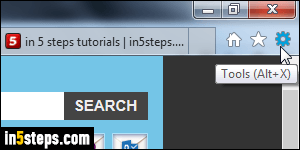 Since Internet Explorer 8, the "classic menus" are no longer visible by default. They are still there, but you need to press the Alt key to show them. 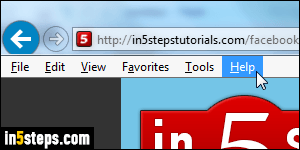 This tutorial shows you how to restore these menus in IE9, IE10, and IE11 (latest version). The new menus are actually all "hidden" under the gear icon, visible near the top right corner of the Internet Explorer window. This new Tools menu can also be opened by hitting the Alt+X keyboard shortcut, revealed in the tooltip. The easiest way to show the classic menus is to right-click on the gear icon. 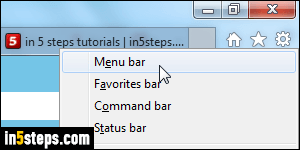 A context menu -popup- will open, showing you the four interface elements you can toggle: click on "Menu bar", the first option. Another way is to hit the Alt key to show the classic menus, and then pick "View > Toolbars > Menu bar". Tip: to show the menus without restoring them, just hit your keyboard's Alt key! As soon as you do, the six classic menus will become visible again: File, Edit, View, Favorites, Tools, and Help - and you can still use the new gear menu! If you have multiple IE windows opened, the other windows won't show the change until Internet Explorer is restarted - don't to worry about that. Did you notice in the previous screenshot how a letter in each menu header is underlined? This is no longer the case by default in recent versions of Windows, but here's a useful trick to know: when you hit an "accelerator key" to show a menu, Windows 7 (in our case) will show all the accelerator keys you can hit to access commands without using your mouse or leaving your keyboard! Alt+F for the File menu, Alt+E for the Edit menu, etc. 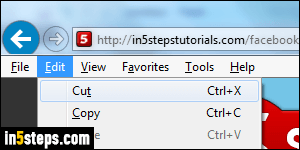 Accelerator keys are different from keyboard shortcuts: you can tell on the screenshot that the top three commands have an equivalent shortcut. 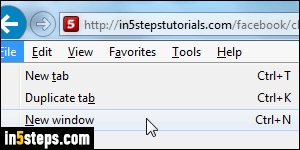 So, you can open a new browser tab either by pressing Alt+F (to show the File menu) and then the letter T, or by hitting the Ctrl+T dedicated keyboard shortcut!